I fell in love with La Foster as a youngster when I saw her play "Becky Thatcher" in the movie, Tom Sawyer. I had previously fallen in love with the character "Becky Thatcher" in a production by the local Children's Theater of Tom Sawyer (who was played by local, young actress Teri Eoff in Lubbock, Texas). The way Ms. Foster has lived her entire life with integrity and anonymity is why I was thrilled that she was honored Sunday night with the Cecil B. DeMille Lifetime Achievement Award at the Golden Globe Awards. Her speech reminded me of why she has been fiercely, rabidly private throughout her 47 years in public life (she started out in show business at age three in as a model for an advertisement). I thought La Foster was supremely true to herself in her speech and everything about her appearance on Sunday night to receive the accolades of her peers on Sunday night. The fact that she had that hateful, irate Mel Gibson sitting beside her (he snarled throughout the ceremony) at her table made me adore her all the more (although I despise him). She is true to her friends. And I also thought it interesting that for this distinguished ceremony she chose to be there with her at her table two of her friends who are also two of the most controversial men in Hollywood: Mel Gibson (is he ever happy anymore or just pissed off and angry?) and Robert Downey Jr.
And she had her two beautiful sons with her at the ceremony on view for the cameras, another way in which she "came out" because she has always sheltered them from the public eye. She is true to herself, always has been. And that to me is one of the most integritous qualities in the world. There have been few like her in the world who have been fiercely brave and also honest to her aspirations, standards, and lifestyle, at least of those people from my generation (I, like Ms. Foster, am 50). Didn't we all know that Anderson Cooper was gay for all these years before he quietly announced it last year? Even he was equally blithe as Jodie in his statement (because they've both been "out" for so long, without saying it to a billion viewers on tv....which is what I think Jodie was trying to comment about Sunday night). I admire her for the way she has bravely lived her life. And I admire her for her long, remarkable and distinguished career (as well as putting herself through Yale). 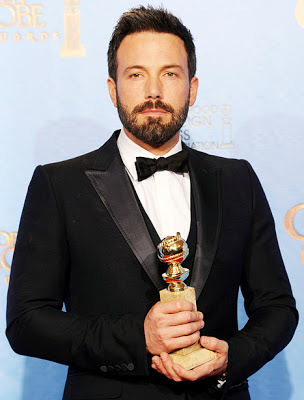 As an aside, I was THRILLED that Ben Affleck and his film Argo won the 2013 Golden Globe awards for Best Director and Best Film, respectively.